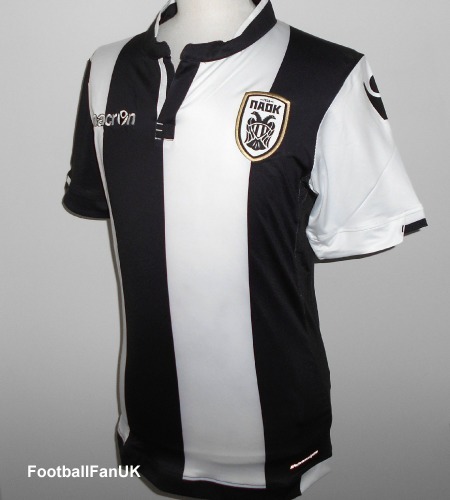 This is an official Macron short sleeve home shirt of Greek club, PAOK FC of Salonika, and used by the club as their home jersey for the 2015-2016 season. Made by Macron from polyester and elastane, the tight fit replicates that as worn by the players, while mesh panels run down the sides to help stay cool and fresh. New with tags in Macron packaging. - Printed Macron shoulder logos. - 'PAOK FC' printing at back of neck. - Black and white stripes. - THESE SHIRTS ARE DESIGNED TO BE A STRETCH FIT . - The shirts come in EU sizes with the equivalent UK/US size being one size smaller. - Adult UK/US-Medium [EU-Large]. Actual chest size is 39", length 29"
- Adult UK/US-Large [EU-XL]. Actual chest size is 41", length 30". - Adult UK/US-XL [EU-XXL]. Actual chest size is 43", length 30".